I think that every successful restaurant needs a “concept”, a unique identity, something that differentiates itself in such an incredibly fierce competitive market that supports the dining industry in Vancouver. It’s an industry which demands continuous hard work from employees and owners with little respite, where margins are typically low and consumer opinion (or a lack thereof) can make or break a business. But the rewards from running a restaurant are high: an idea, creative vision, a passion for food and culture – all these can be transformed into a physical space that is temporarily occupied by visitors who seek to experience new tastes, sensations, socialize, be merry, and above all, satisfy their appetites with delicious, healthy food. I tend to think about restaurants as “experience engines”. As a software developer I like to look at things in terms of the input, output, and transformations that occur during a process. For a restaurant, there are the physical ingredients and energy needed to prepare food – these are the obvious inputs. But there are also the less tangible things, like the moods and attitudes of the serving staff, the restaurant decor, the background music, and then of course the restaurant guests themselves. But I digress, I really should be talking about the food at Posh. Posh is an example of an expanding, successful home-grown restaurant chain with an excellent concept: Japanese Sukiyaki (wikipedia). So what is Sukiyaki you may ask? 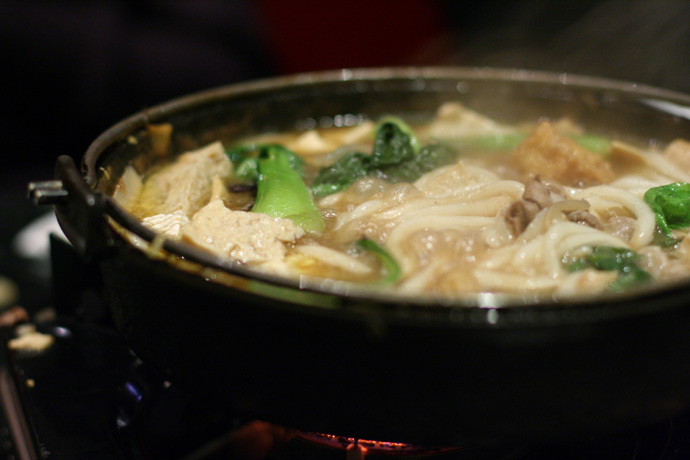 Well, it’s a form of Hot Pot, where you have a gas burner at your table with a large cast-iron pot filled with a bubbling broth. The broth is made with a combination of Sukiyaki Sauce (soya sauce, sugar, and mirin) and cabbage. You add thinly sliced raw beef into the pot along with assorted vegetables, tofu, noodles and seafood, and everything cooks right in front of you. The nice thing is that you decide exactly what you want to eat, and if you particularly like a certain item, such as the fish cakes (yum! ), just order more of it! 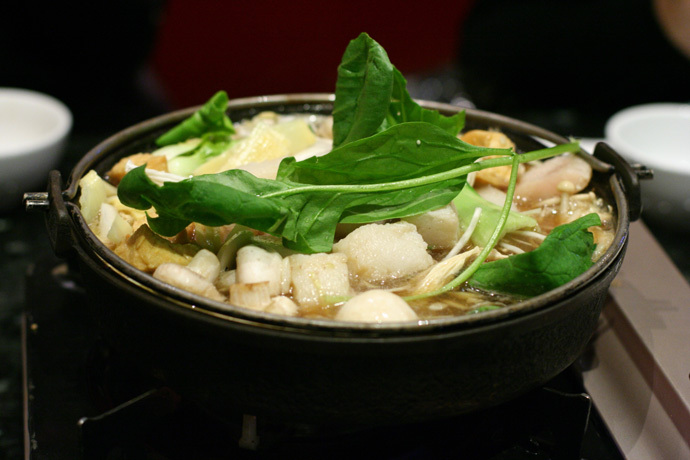 Or if you’re vegetarian, there are plenty of options such as tofu, spinach, and several types of mushrooms to make a soup that fits your diet. Amazingly, Posh provides an “all you can eat” experience for $11.88 per person for lunch, or $15.88 per person for dinner. The restaurant always seems packed at peak times, so it’s a good idea to try making a reservation and coming early to put your name in the queue just in case. Posh’s other locations include Richmond (map, 1123 – 3779 Sexsmith Road, Richmond, BC, Canada, phone: 604-303-7674), Burnaby (map, 105 – 6462 Kingsway, Burnaby, BC, Canada, phone: 604-434-7674), and Victoria (map, 102 – 1063 Fort Street, Victoria, BC, Canada, phone: 250-382-7674). Below are some photos from our dinner at Posh on West Broadway. Hope you enjoy! 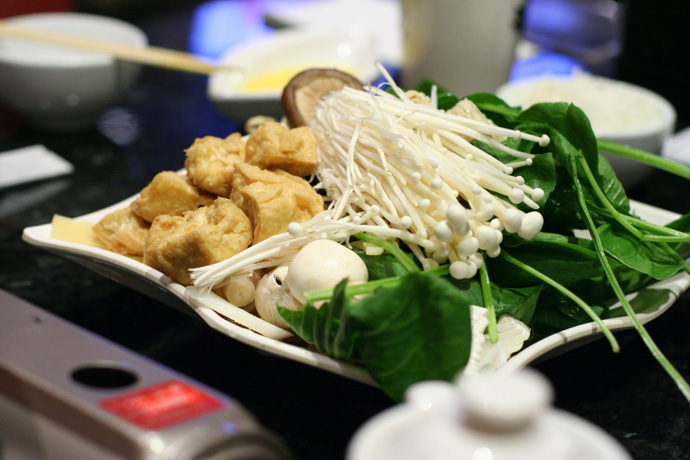 Everything cooking away at Posh Japanese Hot Pot restaurant in Vancouver. 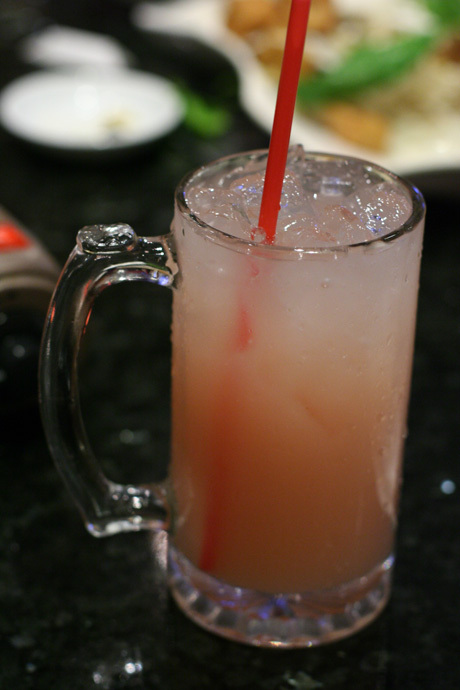 Guava yogurt mixed drink - nice and refreshing! From Posh restaurant in Vancouver. More hotpot cooking at Posh in Vancouver. Vegetarian hot pot ingredients from Posh in Vancouver. Mushrooms, spinach, tofu. Posh on Broadway Photo Gallery by Geoff Peters. Restaurant review of Posh by Angela Murrills from the Georgia Straight. Blog from owner of the Posh restaurant chain. 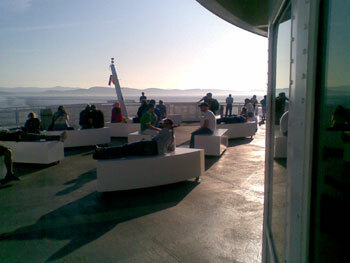 BC Ferries take passengers around beautiful British Columbia (BC) Canada by sea. Start off in bustling and cosmopolitan Vancouver, and ride the ferry over to Vancouver Island. On the island you’ll find Victoria, the capital city of BC and a popular tourist destination. Looking for a longer trip further off the beaten path? Visit the smaller towns on the Island such as Tofino, Ucluelet, Naniamo, Qualicum Beach, Courtenay, and more. The ferries will also take you to the serene and scenic Gulf Islands. 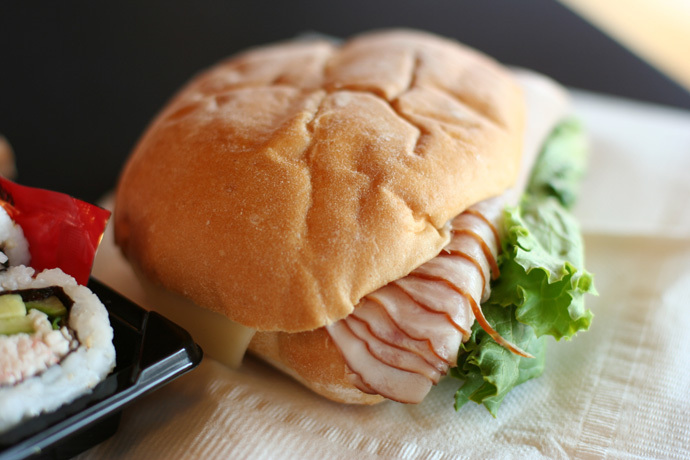 This summer I left the mainland quite a few times, and fortunately for me, there is food service available on board the ferries and in the terminal cafeterias. Pictured below is some sushi and a ham sandwich (around $10) purchased from the Bread Garden cafeteria at the Swartz Bay Terminal. I bought it while I was waiting in line to go back to Vancouver (incidentally after playing a piano gig in Victoria with vocalist Peggy Hogan’s group – live recording here). I am a little hesitant to admit that after my 4th ferry trip this summer I started developing a taste for – or rather, an addiction to – the Bread Garden sushi. 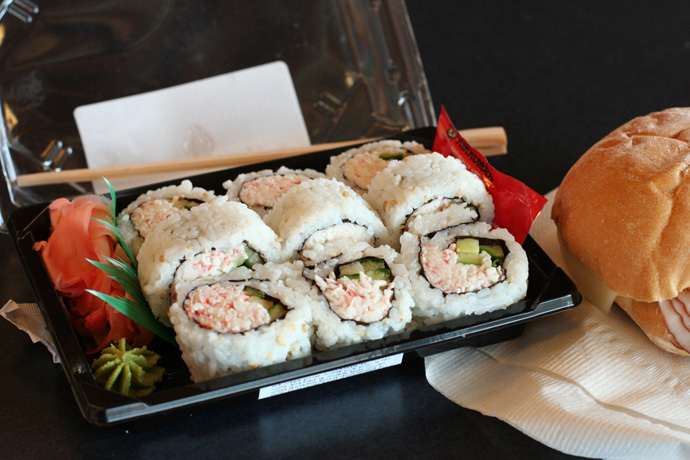 It is now one of my favorite items offered by the BC Ferries food service – but sushi aficionados will tell you that is a far cry from what you can find in most land-based sushi restaurants in Vancouver or Victoria. One upside about the Bread Garden sushi is that a generous amount of wasabi and pickled ginger is provided, as well as chopsticks. I put together a short travel video (accessible in the player below, or on Youtube) from a trip I took last year on BC Ferries from Vancouver to Victoria. The video shows some of the food and shopping available at the Tsawassen Terminal and sunset views of the Gulf Islands taken from the ferry itself. The music in the video is my jazz band, the Geoff Peters Trio, performing live at Cactus Club in West Vancouver on New Years Eve 2007. I (Geoff Peters) was playing piano and joining me was Mark White (bass) and Brennan Saul (drums). For more ferry food, check out my photo of the salmon entree from the on-board BC Ferries White Spot cafeteria, or the smoked salmon bagel I had at the BC Ferries Tsawassen Terminal (on the Vancouver side). Happy sailing! 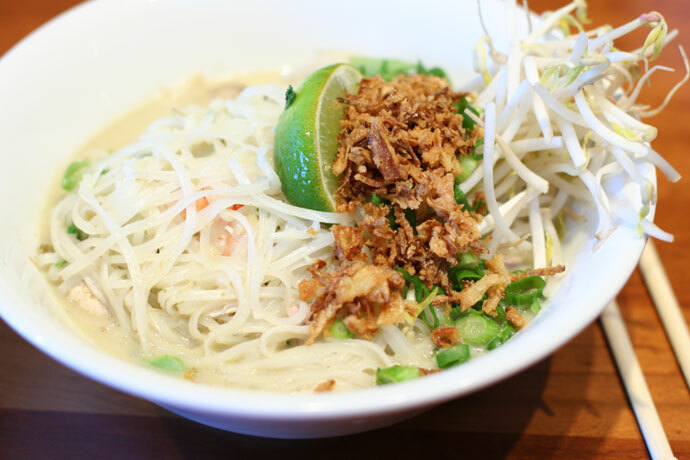 The Noodle Box (web site, map, 1-1867 4th Avenue West, Vancouver, BC, Canada, phone: 604-734-1310) is a South East Asian noodle bar (near Burrard and 4th) that is popular with the young, hip student crowd for casual dining and drinks. The restaurant is cafeteria style in that there is no table service: you order and pay first, and then find a table yourself. When your food is ready one of the chefs will call out your name. The atmosphere is high-energy and lively, making this a great place for hanging out with friends and people watching. Prices for entrees are in the $10 to $14 range, such as the Thai Green Curry (pictured below, around $12), which I ordered with a chicken and prawns combination. Thai spices were simmered in coconut milk and lime juice, served with rice noodles, Asian greens, mushrooms, sprouts, and herbs. Yum! The Noodle Box also has two locations in Victoria: Chinatown (626 Fisgard, Victoria, BC, Canada, phone: 250-360-1312) and downtown (818 Douglas, Victoria, BC, Canada, phone: 250-384-1314). View More Restaurants in the Outside Vancouver Area category. We hope you enjoy the great Outside Vancouver Area restaurants on Dine Out Here Vancouver.